Take olive-studded cream cheese and Parmesan; spread on toasted bread. Top with tomatoes; bake. Add fresh basil and behold: a tasty twist on bruschetta. Preheat oven to 400°F. Mix oil and garlic; spread onto cut surfaces of bread. Bake 8 to 10 minutes or until lightly browned. Cool. Mix cream cheese and Parmesan cheese with electric mixer on medium speed until blended. Stir in olives. 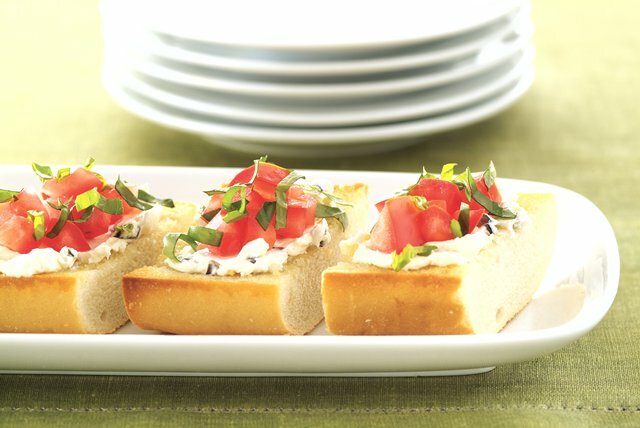 Spread toasted bread halves with cream cheese mixture; top with tomatoes. Cut into 24 slices to serve. Sprinkle with basil. Prepare as directed, using 1 can (14-1/2 oz.) diced tomatoes, drained, for the chopped fresh tomatoes.